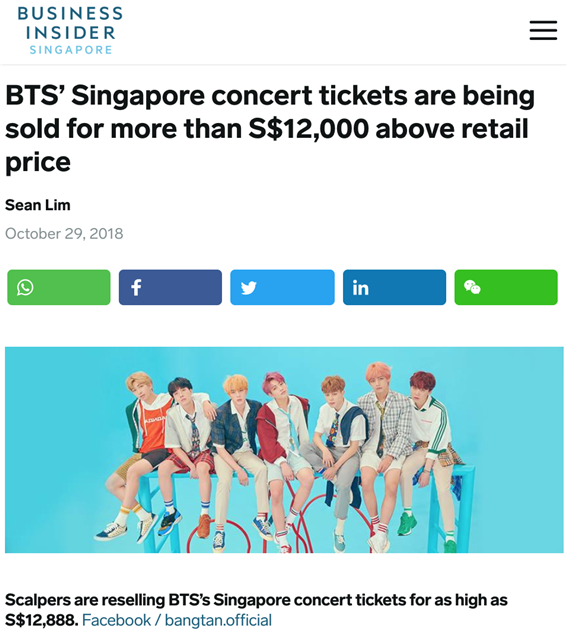 On October 27, ticket sales for the BTS concert in Singapore began, igniting fierce competition for the seats. While there were 55,000 tickets in total, I had to work extremely hard to acquire tickets. I will talk about that experience, and the ticket resale market in Singapore, below. Ticket sales began on the official Sports Hub Tix website. Even though I clicked on its site at 10 a.m. on the 27th, the exact start time for ticket sales, I was immediately put on the waiting list and was notified that those on the list would be moved to the reservation page at random. But even though I waited for over an hour, the reservation page did not appear, and I eventually failed to buy tickets online. Therefore, I could only get tickets after waiting for over an hour on a call with the hotline number. Even during my call, seats in various sections of the concert venue were being snatched up. I was barely able to get tickets for my friends and myself after making it through the call. After I acquired my tickets, I became curious about one thing: if Singapore has a population of about 5 million people, how could 55,000 tickets become sold out so quickly? I concluded that the ticket resale market probably had something to do with this phenomenon. 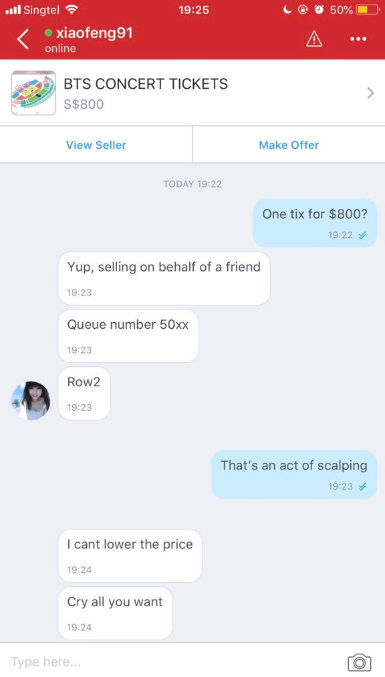 The ticket resale market is thriving in Singapore. 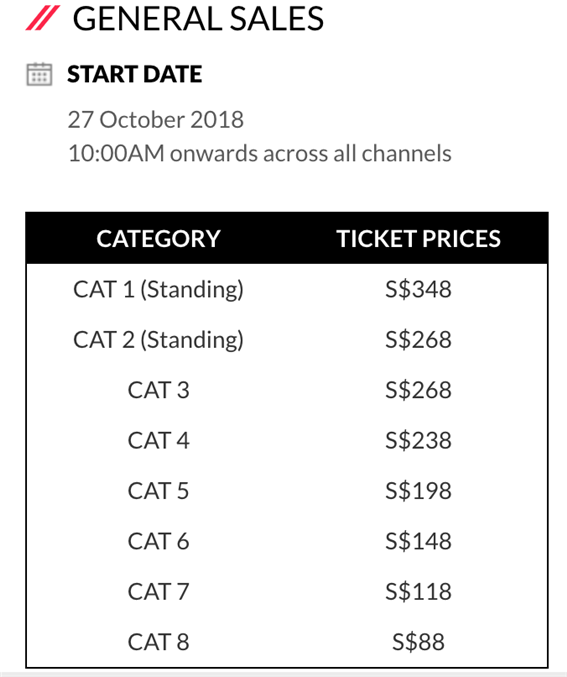 Resellers are selling tickets for the BTS concert in Singapore, which takes place January 19, for as high as SGD 12,888 (about KRW 10,610,000). A photo uploaded by Twitter user Minajun showed that standing seats were being sold for SGD 12,888 each. But the official price for tickets was not that high. The most expensive seat went for SGD 348, or about KRW 290,000. When I tried chatting with resellers, they were selling seats in the back of the venue for nearly SGD 8,000 (about KRW 700,000). Even though I claimed that this was an illegal resale, sellers then told me to not buy the tickets and were unwilling to listen to complaints from buyers. Even these exorbitantly priced tickets were in demand. There was good reason for this: people from all over the world had tried to buy tickets through the official reservation site. Sales drew users from the US, UK, China, Indonesia, and Germany, causing much Internet traffic. Many were presumably trying to resell many of the original tickets at astronomically higher prices. As of November, BTS tickets went for about SGD 1,000 (about KRW 830,000) on reseller site StubHub. 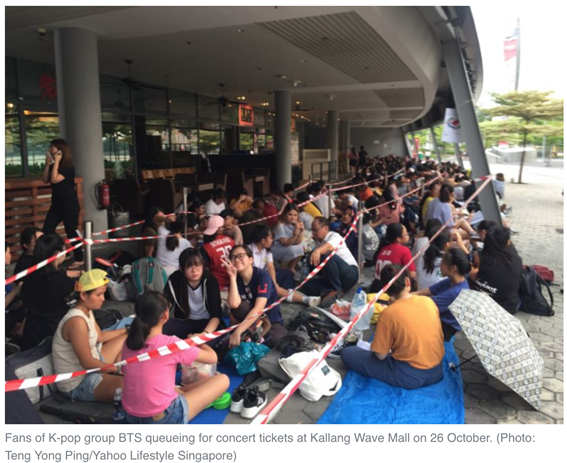 While K-pop’s explosive popularity in Singapore is certainly exciting, more proactive measures must be taken against ticket resales. 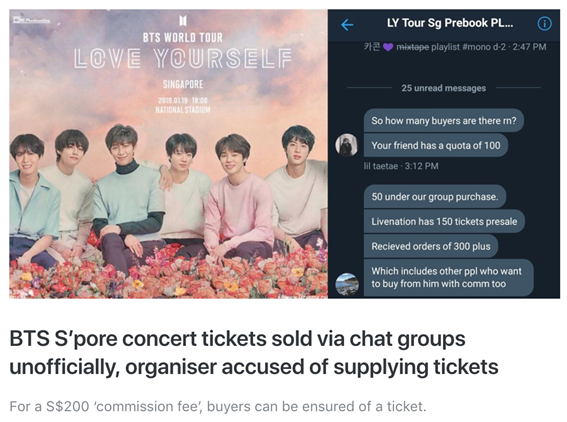 On October 27, the Singaporean Police Force published a Facebook post on illegal ticket sales, telling fans to “buy tickets from official sellers only.” It proved how the flurry over tickets had made waves in the entire country. Although famous singers like Ed Sheeran, Sam Smith, Jason Mraz, Charlie Puth, and Mariah Carey had also made visits to Singapore, ticket resales had never exploded to this frenetic level before. The post from the police drew various responses from Singaporeans. Some called for stricter verification procedures for ticket resales on Facebook and other online portals. 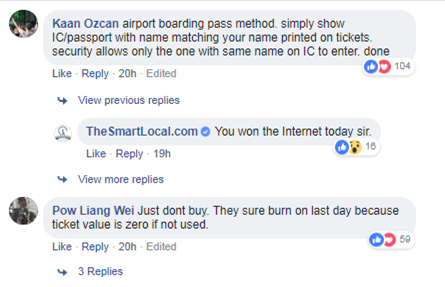 Facebook user Kaan Ozcan said buyers should only be allowed to buy tickets through a strict ID verification process, while user Pow Liang Wei said “just don’t buy,” for the market will disappear if the black market tickets are not bought. 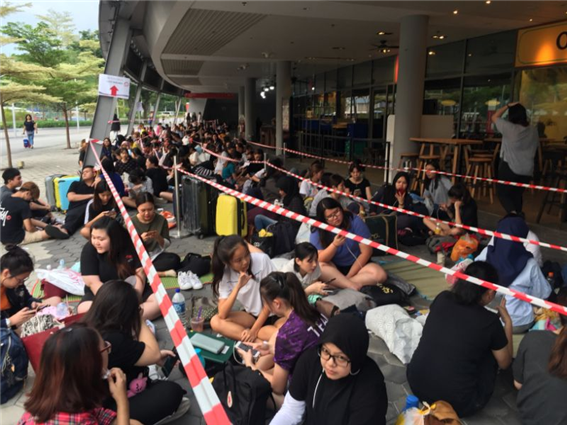 BTS is enormously popular in Singapore, and their Army fans wield much power. 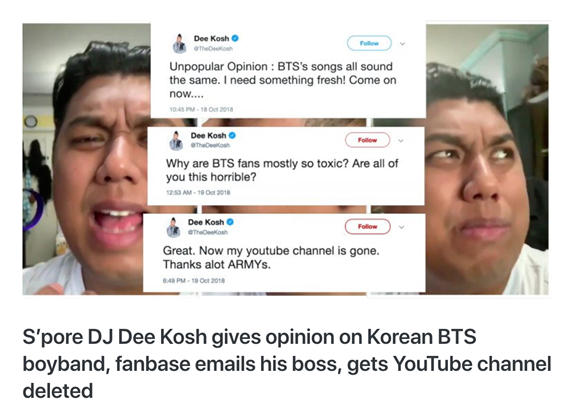 When a famous Singaporean DJ criticized the boy band for having similar-sounding songs, countless Army fans blocked and reported him on YouTube. The DJ’s channel was subsequently deleted, and he was prohibited from posting videos for a set period of time. Singaporean BTS fans had accomplished this feat. While it was incredible to see this kind of unconditional support from fans abroad, I also thought it might be imprudent to completely sweep aside the opinion of one person.